The board meeting agenda posted at the 911 call center does not appear to comply with the state Open Meetings Law. The Lens repeatedly noted problems to board members in advance of the meeting, asking for a complete agenda. The board refused. 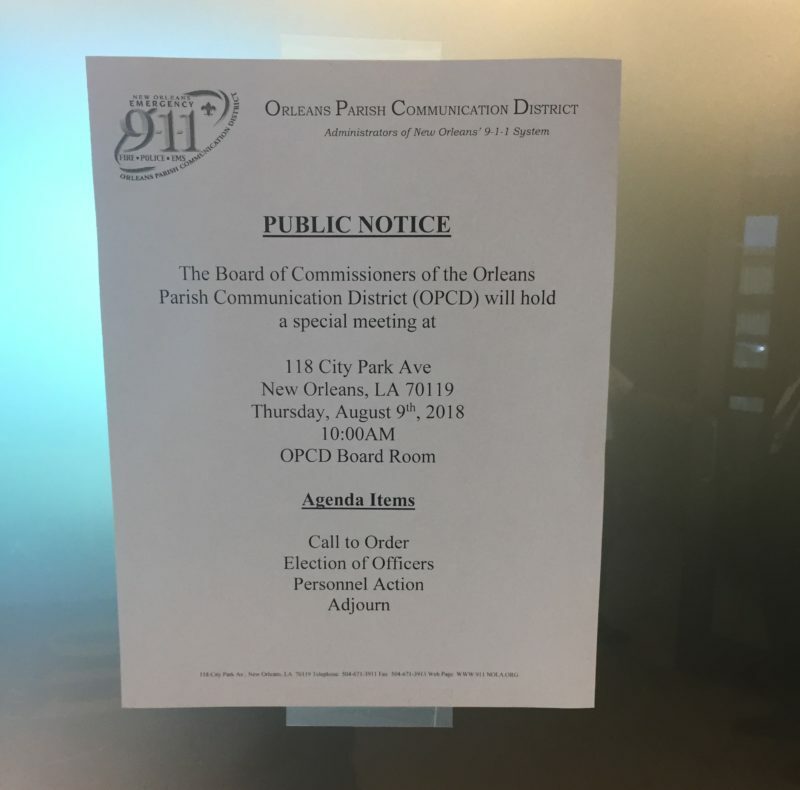 In what appears to have been an illegal public meeting, the governing board of the Orleans Parish Communication District, which oversees the city’s 911 operations, on Thursday fired the 911 call center’s longtime director Stephen Gordon, replacing him with Director of Operations Tyrell Morris. Gordon’s firing came about at the urging of Mayor LaToya Cantrell, who decided to fire and replace Gordon early this week, urging the board to meet as soon as possible to make the decision final. “We’re making this move at the strong recommendation of Mayor Cantrell,” Cantrell’s Communications Director Beau Tidwell said at the meeting. Tidwell, who was appointed to the board by Cantrell this month, replacing Col. Terry Ebbert, called the special meeting earlier this week. Asked after the meeting why Cantrell wanted the board to act so quickly, Tidwell offered only vague answers. “It’s a new administration. It’s a new day. She felt very strongly that a new leadership needed to be in place over here,” he said. Though the communication district is a state-created agency, separate from the city, seven of its 11 members are high-ranking city officials who answer directly to Cantrell. * That includes two at-large appointments now held by Tidwell and Cantrell’s Chief Administrative Officer Gilbert Montaño. It also includes a number of top city employees placed on the board by law because of their positions, such as Fire Department Chief Timothy McConnell and New Orleans Police Department Superintendent Michael Harrison. Both items — Gordon’s firing and Morris’ appointment — passed with unanimous votes, but the board appears to have violated the state Open Meetings Law in several ways, possibly jeopardizing the validity of Thursday’s votes if anyone challenges them in court. In this case, there was only one personnel-related agenda item listed — in spite of the two votes that were taken today — and it did not appear to meet the required specificity standards. The agenda said only “Personnel action,” with no additional details. The Lens asked board members repeatedly about the problems on Wednesday, requesting a full agenda in advance of the meeting. “We believe the published agenda item for tomorrow’s OPCD meeting meets the definition of ‘reasonable specificity.’ A meeting of the board is being called for Thursday at 10am, to deal with a personnel matter,” Tidwell responded in a Wednesday afternoon email. “I would say that language is not reasonably specific,” said Lori Mince, an attorney who has represented media outlets in a number of government transparency suits. She said that under state law, the public has a right to know what government bodies will vote on in public meetings. The board also failed to post the meeting agenda at the 911 call center 24 hours before the meeting, as the law requires. A Lens reporter saw a call center employee taping up the document at 9:40 a.m., just 20 minutes before the meeting was scheduled to begin. Mince said that based on The Lens’ description of the apparent legal violations, the board could have subjected itself to a legal challenge. If successful, such a challenge would require the board to take the votes again, only properly this time. The Lens objected to both personnel votes at the meeting, asking for a legal opinion from the board’s attorney. Each time, Tidwell, who was elected chair on Thursday, noted the comment and moved on with the vote. In a statement emailed to The Lens after this article was first published, Benjamin Chapman, an attorney for the board* said the board complied with the law. “The Public Notice included an agenda separately listing and describing with reasonable specificity each action to be taken during the special Board meeting,” he wrote. He added that the notice had been posted in City Hall days in advance of the meeting. State law, however, requires public notices to be posted at the “principal office of the public body holding the meeting,” or, if that doesn’t exist, at the meeting’s location. Thursday’s meeting was also unusual in the haste Cantrell’s administration took to have Gordon fired. Gordon had been with the agency since 2008, having previously served as a New Orleans police officer for 33 years. Gordon said he has not spoken with Cantrell and was not familiar with her reasons for demanding his firing. “I’m an at-will employee. They can make that decision if they want to,” he said. Tidwell repeatedly insisted that Cantrell, as a new mayor, wanted new leadership at the agency. However, she waited three months after taking office to make the move. Then she made her decision abruptly on Monday, and insisted that the board meet this week, even though both the vice chairman, Dr. Brobson Lutz, and Morris, Gordon’s replacement, were out of town. In a phone interview this week, Lutz told The Lens he disagreed with the decision to fire Gordon. He noted that Gordon headed the organization during a major transition, the consolidation of the city’s emergency communications operations and personnel — who had previously worked for city departments — under the communication district. This post was updated after publication to include comments from the communication district’s attorney. *Corrections: This story originally reported that nine of the board’s 11 members are city employees. The correct number is seven out of the 11 members. In addition, a statement originally attributed to attorney Juan Lizarraga was actually authored by another attorney, Benjamin Chapman.